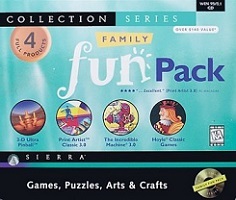 Hoyle Classic Games, Volume 5, will entertain the entire family. Whatever your favorite, you just might find it in Hoyle Classic Games. 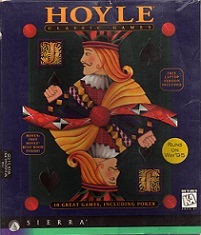 This latest in the Hoyle series includes eight card games (Poker, Bridge, Crazy Eights, Gin, Hearts, Old Maid, Cribbage, and Solitaire) and two board games (Backgammon and Checkers). What's more, Hoyle Classic Games provides opponents when you want to play, not when you can get four people to agree on a time and place. Draw Poker is the new card in the Hoyle hand. You can ante, bet, fold, and bluff against characters with their own habits and quirks (developed especially for this edition of Hoyle). You can even change the atmosphere: customize the screen to set the game in the Old West, for example, without having to worry about cigar smoke and bullet holes in your living room. Hoyle Classic Games also introduces the Attitude Meter: set the tone of the opposition, from serious to absurd. In serious mode you get intense opposition and good manners. In the absurd game you get sore losers and a breakdown in sportsmanship! Don't let conflicting schedules stop you. When you want to play backgammon you want to roll the dice now, not a week from Thursday. Hoyle Classic Games is just what the classic game player has been looking for.